Integrity, hard work, organization, dedication and a sprinkle of creativity…these are just a few of the qualities that make us great at what we do! There is no mountain too tall for our team to tackle. We have the knowledge and know-how to prepare your home to sell and optimize its highest return. On the buy side we will work tirelessly to place you into your dream home and negotiate to ensure it comes at the best price. We are customer driven and desire to make sure our clients have the best possible experience. Not only do we take the stress out of buying or selling by guiding you through the process, we make it an enjoyable journey. We grew up in small towns in Nebraska and possess that hard working attitude. We know what it takes to get the job done and we aren’t afraid to roll up our sleeves to make it happen. Whether it’s buying or selling, we go the extra mile. Consulting you on everything from de-cluttering, to what paint color might best showcase your living spaces, or what to do with that pesky problem area in your basement you’ve never figured out. We have an eye for detail and know what changes to suggest to net you the highest possible return on your home. Not only are we creative, we are business women. Daria is a graduate of Wesleyan University and the owner of several Scooters Coffee locations. She has built a very successful business from the ground up. She also has excellent marketing skills and has a background in human resources, having worked for a Fortune 500 company. Marsha has experience general contracting houses as well as whole home renovations and owns multiple rental properties throughout Lincoln. These skills, married together give us the background to give you the best possible service. Hiring us as your real estate professionals gives you peace of mind. Two sets of eyes watching over one of the biggest transactions you will make in your lifetime, two sets of eyes watching over your family, two sets of eyes making sure no detail is missed. 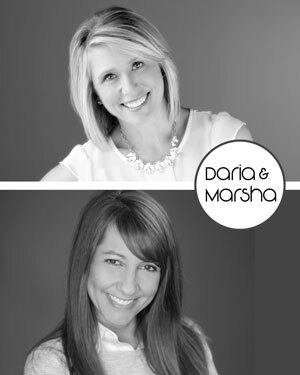 That is the power of choosing Daria and Marsha as your REALTORS®.